This business project management assignment brief in this we have explore cost benifits, team organization structure, communication plan etc. For WBS, OBS and other large documents please upload them to an online storage (i.e. Dropboxor Skydive…etc) and later add the Drop box or Sky Drive link(s) in the PowerPoint slide(s) for the specific slide title. The majority (95%) of your written work should be in your own words. Cutting and pasting large sections of text from the Internet or a book (even with referencing) is an example of plagiarism and will automatically incur a zero grade. Direct quotes should be in quotation marks with a page number & Year reference to the original. Each sentence or paragraph that has been written from researching sources should contain a reference. If you are unsure of what constitutes plagiarism, check with the Unit Coordinator (Tomayess Issa) before submitting work for assessment. Resubmission of a plagiarized assignment will not be permitted. CCC is a significant Western Australian fashion business. It has experienced strong growth for several years. Through its clever fashion marketing and astute acquisitions, it has projected growth of 15% pa revenues for each of the next 7 years. Last year the business had revenues of $90 Million. The company is very profitable and has good reserves of cash and lines of credit. Physically, the business consists of offices for administration, marketing (Online and Traditional) and fashion facility, which while fully paid is very expensive to operate compared to modern facilities. The main office is in the city. While it owns this property, it believes it can realize $10 Million through its sale. As well, the business has 12 branches scattered throughout the city with total annual rental of $0.9Million. A preliminary plan has been developed to improve efficiency and allow for continued growth. A new IT system will be introduced. It is an off-the-shelf system widely used in the industry, and will integrate all administration, marketing (Online and Traditional), and fashion functions of the business. IT hardware will be moved from the old premises (this was upgraded only last year and is thought to have the capacity required). However existing communications services will need to be transferred, new processes built (the new system works differently from the old one), and implementation, testing, evaluation and training arranged. The new IT system will cost $1.9 Million to purchase. In addition, consultants from the software vendor estimate their team can configure the systems and oversee the implementation requirements in 8 months – 4 months of configuration in their offices and 4 months of on-site support of the in-house project team. Their team will charge a fixed fee once the scope is finalised and this is estimated at $130,000 per month. The plan stipulates that there must be no disruption administration, marketing strategy, and fashion functions of the business, so this suggested the transfers be completed over a weekend only. The CEO of CCC fashion Ltd has heard that your “BPM501 Group”small consulting company is the best company to project manage this project. She calls you in for a meeting and after the usual pleasantries and cups of tea you get down to business. She is so impressed with you that she gives you the assignment on the spot, and is happy to pay you what you want (so you will of course add that in to your costing). However she warns that you must succeed and will “never work in this town again if it goes wrong”. The stakes are high! Detail the business case, since it is currently quite general. You agree but realise you will need to do research on the electronic products and the technologies you are dealing with. 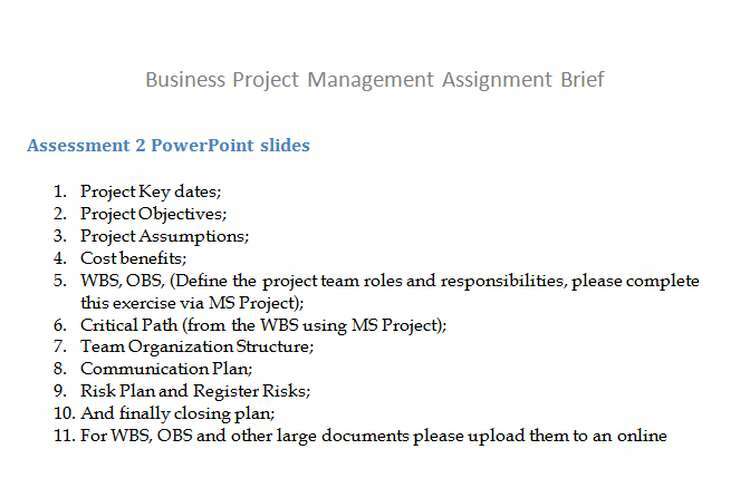 You will produce a project charter in a format that is suitable for presentation to the board. Your business case will be incorporated into the charter. Because this is to be presented to the board you decide to do this in no more than 20PowerPoint slides rather than a traditional report. You will be sure that scope, project design, milestones, risk plans, risk registers and team design are all represented summarised from other steps detailed above. This evaluation is designed to encourage you to think about and understand how well you and your pair performed the team activity in order for you to develop these important skills. Research indicates that students who reflect on their performance have more control over future performance of targeted skill(s), are better able to articulate their progress and demonstrate increased self-confidence in a range of situations. Note: the lecturer mark is where the lecturer can reward effort, contribution and leadership capacity on an individualised basis, however, all students have the capacity to receive full marks on this component of the assessment if s/he has proved a superior contribution to the group functioning. These evaluation forms are confidential and enable the lecturer to get an insight into how well the team/group process functioned and to track your contribution. Fill out this evaluation on yourself and your group members (peers) honestly and submit to the blackboard Peer Evaluation, as well make sure to submit with the same document your draft notes/resources as PDF. Ensure to put your name on the Self/Peer Evaluation Schedule (A) and your pair members’ name on the Self/Peer Evaluation Schedule (B). Your Lecturer will read your group’s work and identify how well the pair functioned. This will also reveal if he/she needs to make any organisational changes to the activity the next semester. Please Note: This is your opportunity to tell the lecturer if there were any problems with the pair interactions, division of workload etc., so be as honest as you can. Even if your group did not function well, you have the capacity to earn the individual marks if you made every effort to complete the assignment well. Your feedback will be collated with your peer and marked according to insights provided about what you learned from doing this experience, honesty of responses and level of completion.